Temperature: June is the first month of summer in Tallinn, Estonia and has an average temperature of 15°C. In the afternoon, the average high is 20°C, while at night it drops to an average low of 9°C. Both of these averages increase in the course of the month—the end of June is noticeably warmer than the beginning. The sea temperature average is 14°C. Rainfall: ​Summer is the wettest time of the year in this coastal city and June marks the start of it. With a total amount of rainfall of 35mm, and 13 days with precipitation, June receives its fair share of wetness. That being said; the chance that you will experience rainfall averages 46%, which is relatively low for this region. The types of rainfall that are most common are light rain and moderate rain, which respectively occur on 41% and 37% of the days with rainfall. Clouds: Cloud cover ranges around 77% this month and doesn’t vary much. The sky above Tallinn is fairly cloudy throughout the whole year and June is no exception. You can expect (mostly) clear skies only 9% of the time in this city. They are most likely to be mostly cloudy. Pharmacies are usually open from 10:00-19:00. Two of them stay open all night: Südameapteek – Tõnismägi 5, ph: +372 644 2282 and Vikerlase 16, ph: +372 638 4338. Tallinn Creative Hub is situated within walking distance of the Old Town. If you need to travel longer distances, we recommend public transportation (trams, trolley-buses and buses), which are clean and reliable. You can find out more about the public transportation and schedules here. If you buy the ticket from the driver, it costs 2 EUR, more information about tickets is available here. It can be reached by taking trams no. 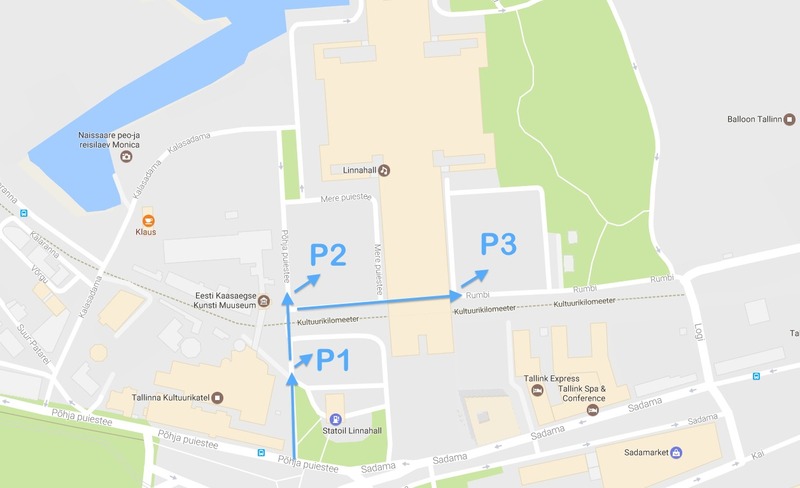 1 (Kopli–Kadriorg) and 2 (Kopli–Suur-Paala), and getting off at the Linnahall stop. Buses no. 3 (Veerenni–Randla), 21 (Balti jaam–Landi), 21B (Balti jaam–Kakumäe), 41 (Balti jaam–Landi), 41B (Balti jaam–Kakumäe) and 73 (Veerenni–Tööstuse) also stop here. Taxies: We recommend the electrical taxi company, call +372 588 588 00, or Tulika taxi company: +372 612 0000. The app Taxify is very popular. For more specific information, please contact the nearest Estonian consulate or embassy, or check the Estonian Ministry of Foreign Affairs' website. The electrical current is 220 volts AC, 50 Hz, European-style 2-pin plugs are in use.